Easter is a time for celebrating rebirth and new beginnings celebrat this Easter in style with the fun recipes games and craft ideas. The ebook gives you instructions to make mouthwatering dinner recipes such as Easter Roast Lamb with Apple Tartlets, classic Hot Cross Buns and Maple-Glazed Roast Turkey Breast with Cornbread. Or how about some great confections like Easter Bunny Cake, and the World\'s Best Chocolate Easter Eggs. You will also find easy to make craft ideas for your child as well as puzzles, coloring book pages and games for hours of Easter activities. 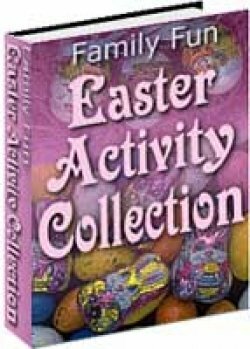 With over 200 pages of family fun, you will find an array of tasty confections and simple craft projects that will put your family in the Easter spirit.